At the recent Broadway Golf Club’s Christmas 200 Club Captain Michael Lindner and Ladies Captain Sonia Ward were delighted to award their captaincy donations for 2013. The impressive sum of £2,500 was presented to Sarah Taylor, joint chairman of the Campden Home Nursing Organisation, a charity which provides nursing care for the terminally ill who wish to be looked after in their homes. The funds were raised through a culmination of many golfing events taking place at Broadway throughout 2013, in both the Mens and Ladies members sections as well as numerous Open events. A further significant donation of £1,300 was also made to Epilepsy Action, which supports the research and work in improving the lives of those suffering from epilepsy. Both Michael and Sonia, would like to pass on their gratitude to all members and visitors for their generous support. 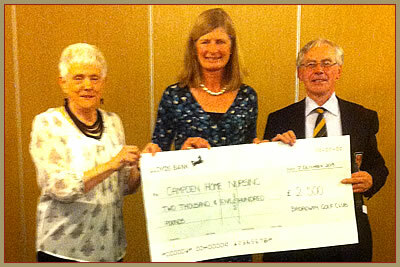 Photographed making the donation, L – R : Ann Fairbairn, Lady Vice Captain (on behalf of Sonia Ward), Sarah Taylor – Campden Home Nursing and Michael Lindner, Captain.